There’s nothing better than a summer ripen tomato. Do you have tomatoes growing in your yard/garden/pot or even in a hanging upside down pot? If you do, you really need to try this salad. If you don’t have them growing (like me) then go to a farmer’s market or road side stand and buy the freshest smelling ones you can find. What is that incredible smell (some call it summer perfume) when you put a freshly picked tomato to your nose. If you have ever brushed against a tomato plant you will know that smell or for me have my now deceased dog coming in smelling like the most perfect tomato you could have wanted to eat, but she got to it first. Would you describe them as earthy, musky, sweet, tangy. The tomato has a unique aroma, odor, fragrance, or scent; and no matter how you describe it most of that smell comes from the stem and foilage than the fruit itself. When we did those bar-b-q pork steaks a while back that I was telling you about, my husband wanted me to look up side dishes that maybe were difference than what we normally do. Of course, I knew what I was going to find — at Southern Living I found there top 10 bar-b-q side dishes and what were they? — deviled eggs, coleslaws, beans, tomatoes, etc. Exactly what we normally have with bar-b-q. Sometimes we might do cheese grits and years ago we use to do potato salad a lot but there are certain things you just must have with bar-b-q. 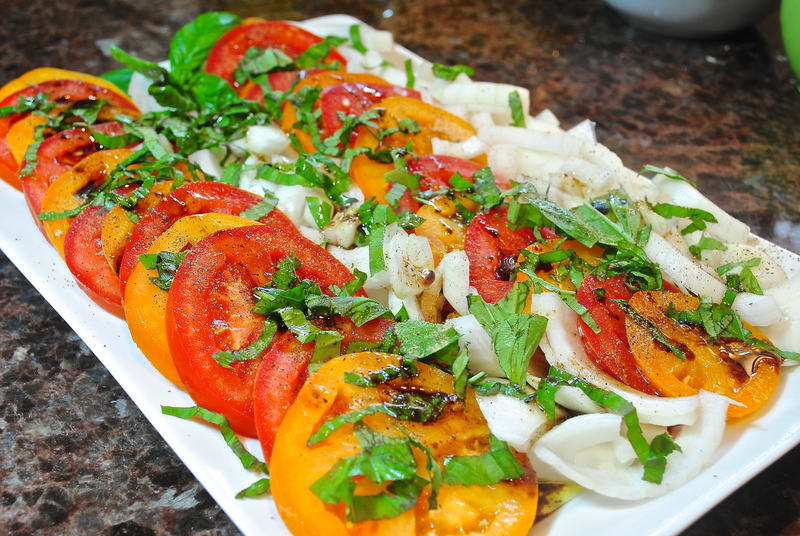 Do you have favorite side dishes for your cookouts whether it’s bar-b-q or anything grilled? If you do, please leave a comment below. BLAST FROM THE PAST: Orange Tian was a dessert I made while I belonged to the Daring Kitchen website. People were given a recipe and they could do their own take on it and then everyone posted pictures of their finished project. I hope to get back to doing that soon. I used yellow and red tomatoes. The heirloom tomatoes were beautiful but almost $6/lb. 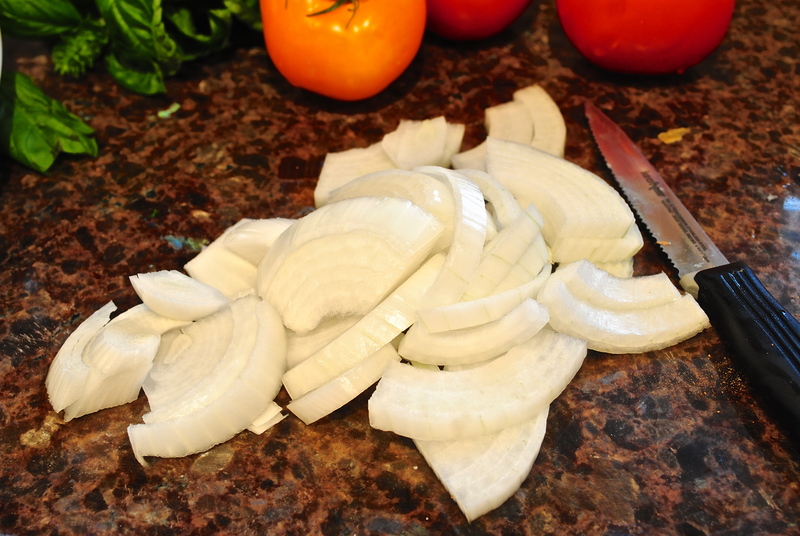 Slice onion in half, cut into thin slices and then slice in half again. 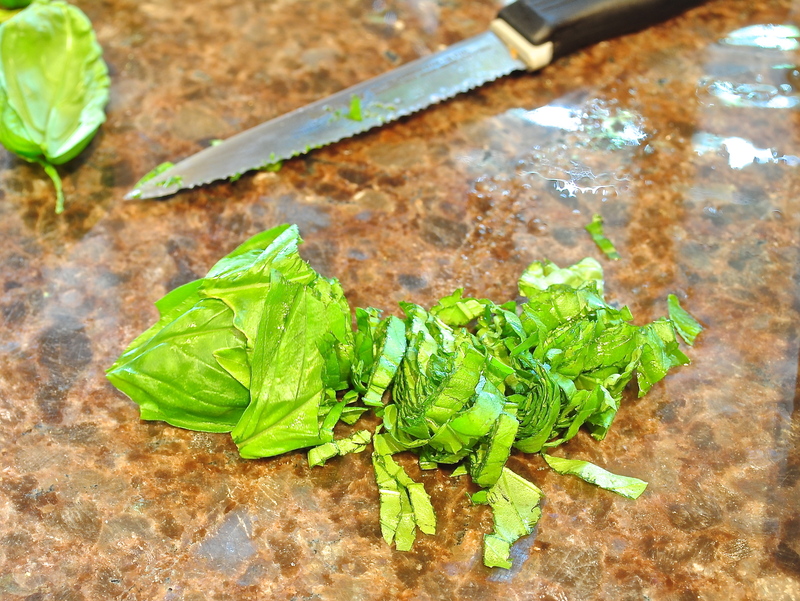 Roll the basil leaves into a chiffonade and then cut into thin pieces. 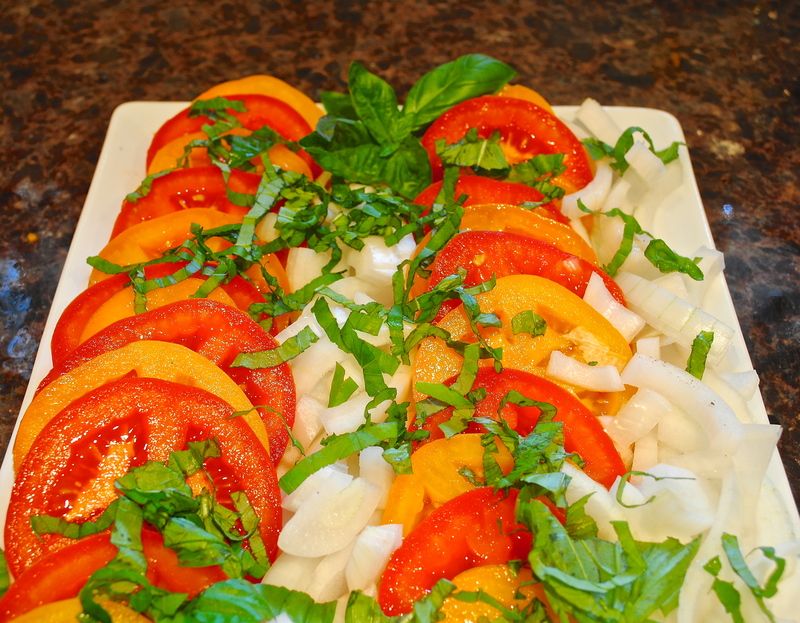 Make rolls of tomatoes and onions on the platter. 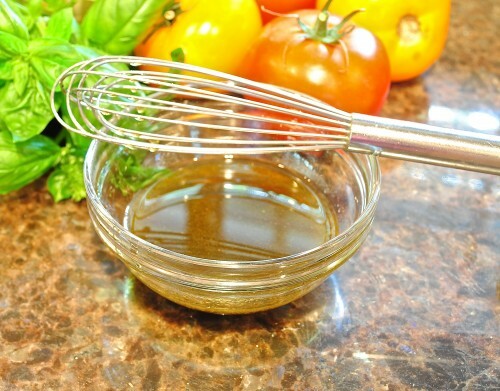 Sprinkle with the basil and then drizzle with the dressing. 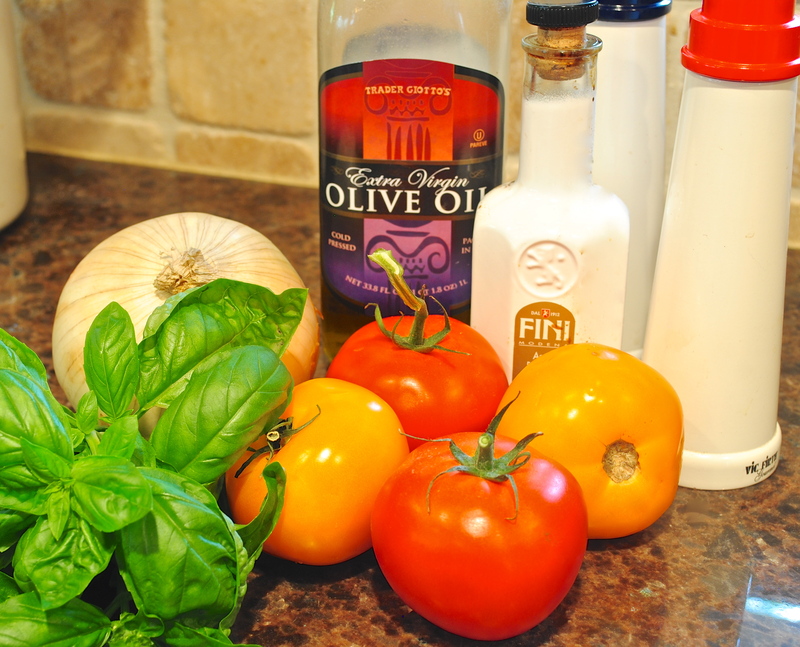 Whisk together the first five ingredients in a small bowl. 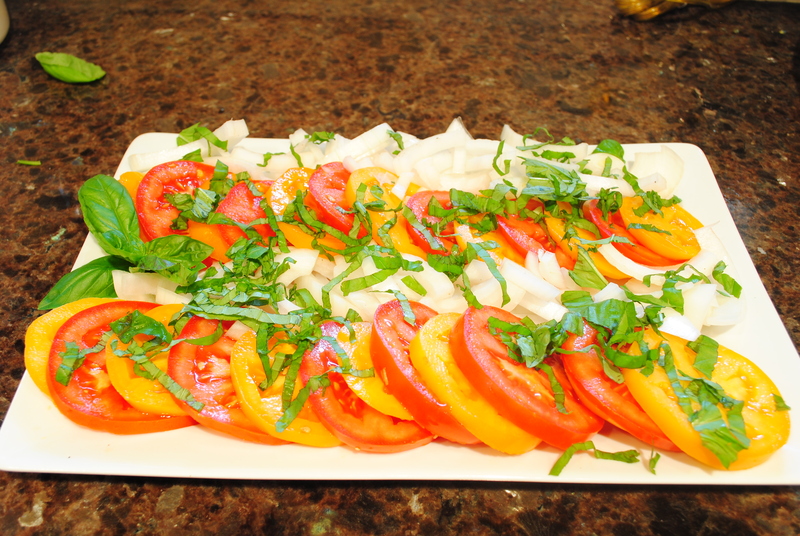 Arrange tomato and onion slices in rows on a serving dish. Sprinkle with chopped basil, and drizzle evenly with marinade. Cover and let stand at room temperature for at least 2 hours. Serve with a slotted spoon.